Kharsali is a small village across the river Yamuna from Jankichatti , 214 km from Rishikesh. 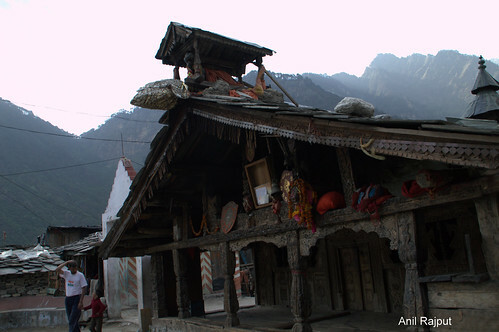 During the winters the main idol of Maa Yamuna or Yamunotri is kept at Lord Shani Dev temple at Kharsali which lies at 2675 meters from the sea level . This place is also known as Khushimath is one kilometer from Janki Chatti across the River Yamuna. It is not only the winter seat of Ma Yamuna but there is a oldest temple of Lord Shani Dev who happens to be the brother of Ma Yamuna and in-charge of punishing the crooked and bad people but he also rewards the good people . 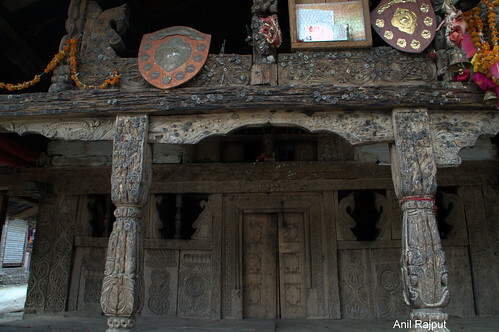 This temple is very old constructed of stone and wood without using the mortar to fix the two stone slabs together , an old inscription on a stone slab is in a language which is yet to be translated by the Archaeological Survey of India. Yamuna, The daughter of the Sun God (Surya) and consciousness Chhaya (the Shadow) she has one sister Sangya, brother Shani Dev, Yamraj . Gangotri as cousins . Every year around the first week of May on “Akshya Tritiya”, Lord Shani Dev accompanies his sister Yamuna seven km up to Yamunotri and returns back to Kharsali . He again meets to bring her back on the “Bhai Dooj” or “Yam Dwetiya” two days after Diwali it is also a day for Yamuna to meet her brother Yamraj. ( Lord of taking away the spirits after death). Who built this temple here at Kharsali, an inscription on stone on its wall could not be translated till now, locals believe it is constructed by the Pandavas, looks more like fort, it is a stone and wooden four story structure. The main structure is constructed in a way by using stones, wood the Urad dal or Vigna mungo (botanical name Lens culinaris) is used as a part of mortar to fix the stones together. It has faced the mighty earthquakes and floods with no damage to the building since immortal time. One can climb up through a narrow stairs, the main Bronze idol of Lord Shani Dev is kept here along with the Chaaya (the Shadow), the Sangya (the conciseness) and the Nag Devta, there are two urns one big and one small are kept and no one touches them because of any unforeseen danger to self or family, there is a belief that these Urns change their position themselves on Purnima (Full moon night) and Amawasya (Dark night) the Yamuna Idol is kept during the winters on the first floor. The helipad for Yamunotri is at Kharsali, this helipad serves to the pilgrims during the Yatra period , Yamunotri temple is Seven km. from the helipad.